Opera singing is undeniably the human voice at its most incredible. We’ve chosen a few prime locations to add to your Operatic bucket list – how many have you visited…? The first Glyndebourne Opera Festival took place in 1934, and has been delighting fans during the summer months ever since. This beautiful rural Opera destination, not far from Lewes and indeed the South Coast, sits in the grounds of a splendid country estate. You can even bring a picnic – what could be more quintessential? 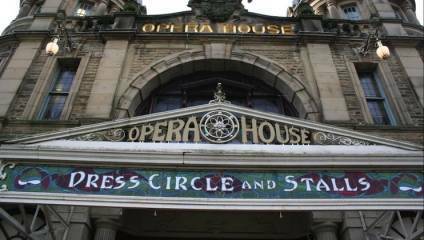 Buxton’s iconic Edwardian Opera House sits resplendent in the centre of this picturesque Derbyshire spa town, and offers a diverse year-round programme that includes some 450 shows, from dance to comedy, drama, and – naturally – musical concerts. Buxton International Festival runs in July: a summer celebration of the very best opera, music and literature, right at the heart of the beautiful Peak District. The longest-running theatre in Scotland, Glasgow’s Theatre Royal opened in 1867 and has survived three fires, two world wars, conversion to a TV studio theatre and back, and recently, a multi-million pound refurbishment. Its contemporary foyer has become iconic for the dramatic spiral staircase. Expect a variety of shows, not least from the Scottish Opera and Scottish Ballet, who both call this theatre ‘home’. This unique, family-run performance space in the heart of the Gloucestershire countryside was built in a converted barn in 1996. In 1997 they managed to salvage some unwanted theatre seats from the Royal Opera House in London, which was being refurbished at the time – and with just 500 seats, this intimate venue keeps the whole audience deeply immersed in the action. Real Opera fans will want to head to Salford’s Lowry arts centre, rather than Manchester’s Opera House, which is more of a musical theatre venue these days. The formidable Lowry, which is also a registered charity helping facilitate productions across all disciplines, is named after celebrated artist LS Lowry, who lived and worked in the area. The nearby Salford Museum & Art Gallery has been a long-standing collector of his work, and you can find over 400 examples there.